Let's get this out of the way: watch this clip, but stop at the 9:55 mark, right as it cuts to TK and Kari in the woods. You don't want to see what TK and Kari are actually doing in the woods. It's all about what Davis thinks TK and Kari are doing in the woods. At least he would if Yolei wasn't suggesting that they... just watch the clip. The dub of Pokémon lives off of suggestive lines and scenes like this. When it's executed this well in Digimon, it's worth celebrating. Even better, the next time we see Yolei, she's blowing up a ball... if you know what I mean. Naughty interpretations aside, this episode had plenty of interesting talking points, but was pretty subdued throughout, with plenty of scenes that seemed to stretch to kill time, such as Minomon suggesting that Ken do jumping jacks after eating too much, Davis explaining why he was late to Digital World cleanup duty (which made them even more late) and three transformation sequences that turned out to be duds. For all the new plot developments, there wasn't much story to this one. The screentime may have gone to the digidestined, but for all intents and purposes, the plot is now focused squarely on Ken. His home life is still awkward, but he's making kind gestures like eating more than his share to make Mom happy (never mind that just last episode she resolved to not badger Ken about such things). He shrugs this off, but finds it a little harder to ignore the creepy woman in his bedroom. Arukenimon is downright vicious, calling Ken a useless failure before disappearing again. Given how much Mummymon hams it up later and ruins her image, it's easy to forget just how effectively she pulls off the mysterious and malevolent. Clearly she's a villain and clearly Ken's been on a string this whole time, but whether she's the villain and puppetmaster is still left vague. This exchange is what really drives the episode, just under the surface. 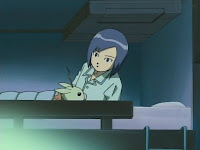 The digidestined all wonder why the control spires are suddenly active again and preventing Veemon, Gatomon and Patamon from evolving. This isn't explained, but it's clearly implied that Arukenimon has something to do with it, and Ken and Wormmon are going after her, destroying the offending spire in the process and allowing Armadillomon to evolve after the others have failed. For the debut of a new form, it's a pretty run-of-the-mill dynamic digivolution, and the others are more confused than awed by Ankylomon. Worse yet, Ankylomon is ill-equipped to beat this week's bad guy, a speedy Thundermon that seems to be acting on its own volition. It takes an intervention from Stingmon, a new form of Wormmon that didn't even get an evolution sequence. Stingmon kills Thundermon, which didn't curry much favor from Yolei or Cody who hadn't been exposed to Digimon murder yet. Ken just walks away without taking questions. Cody gets the real raw deal here because this was apparently supposed to be a Cody episode. While Kari's concerned about Ken, Cody's far less forgiving, channeling his rage into his kendo, which never ends well. In an incredibly bizarre moment, his grandfather manages to use Go-Gurt as a metaphor for being open to new ideas and keeping your thoughts fluid and flexible. Liquid yogurt: how does it work?! At this point, we should all be wondering if Cody's grandfather is wise and sage-like or just plain senile. Shockingly, the three most awkwardly scripted moments in the episode were not dub creations. Minomon's jumping jacks, the Go-Gurt metaphor and Davis defending his decision to play soccer in a classroom were all more or less taken directly from the Japanese version. Silly sub. Yolei's gotten downright abusive, having Poromon bounce up and down on her back for a massage. TK's in middle school, but is apparently playing with blocks. It doesn't look like it's a puzzle or anything, yet he's somehow satisfied that he's created something he thinks Davis can't. I bet he can beat Davis in Popsicle stick houses too. 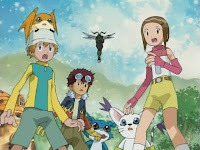 Why exactly did TK and Kari feel the need to be so secretive about sneaking off to the woods to see if Patamon or Gatomon could evolve, especially considering how their cover story was so... open to interpretation. About an hour, Kari?